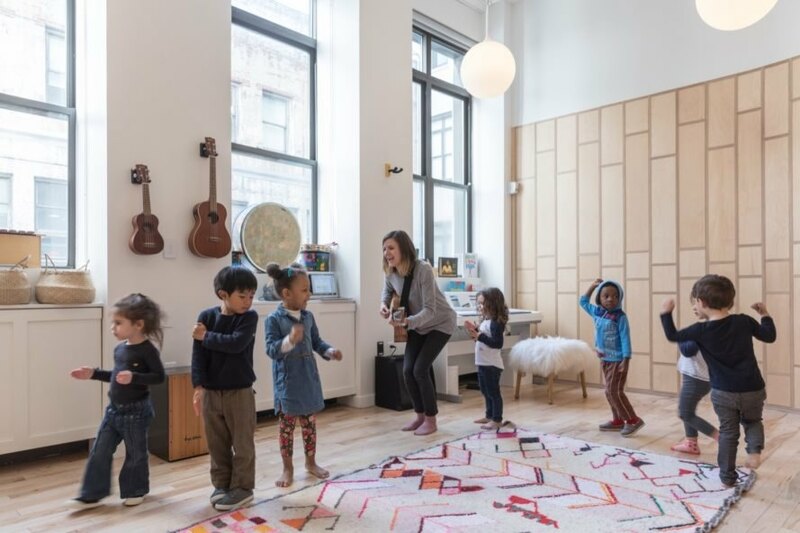 Creative co-working giant WeWork and acclaimed architecture firm Bjarke Ingels Group have teamed up to reimagine education starting with the launch of WeGrow, a new school in the heart of New York City that encourages education through play. 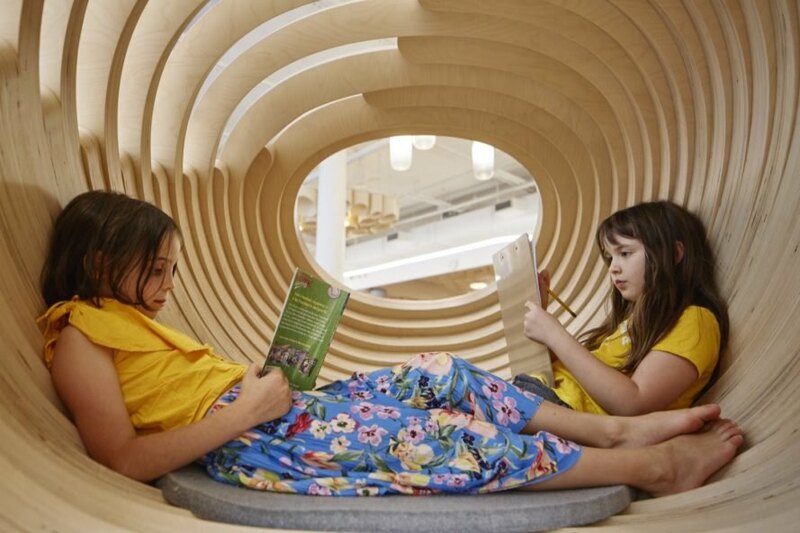 Designed for children between three and nine years of age, the light-filled learning landscape is a tactile environment filled with custom-made curved architecture and movable furnishings. The theme of nature runs throughout and can be seen everywhere from the woodsy palette of timber surfaces and shades of green to the Laufen-tiled vertical garden filled with leafy plants. In addition to diverse playscapes, the school consists of four classrooms, flexible workshops, community space, a multipurpose studio, an art studio and a music room. Hard corners are eschewed in favor of round, organic forms, like the curved storage units built with three different shelving levels for each age group. Sound-absorbing “clouds” made from felt and decorated with nature-inspired patterns hang from the ceiling and are illuminated with Ketra bulbs that change in color and intensity depending on the time of day. Felt is also used in the lobby and in the lounge. 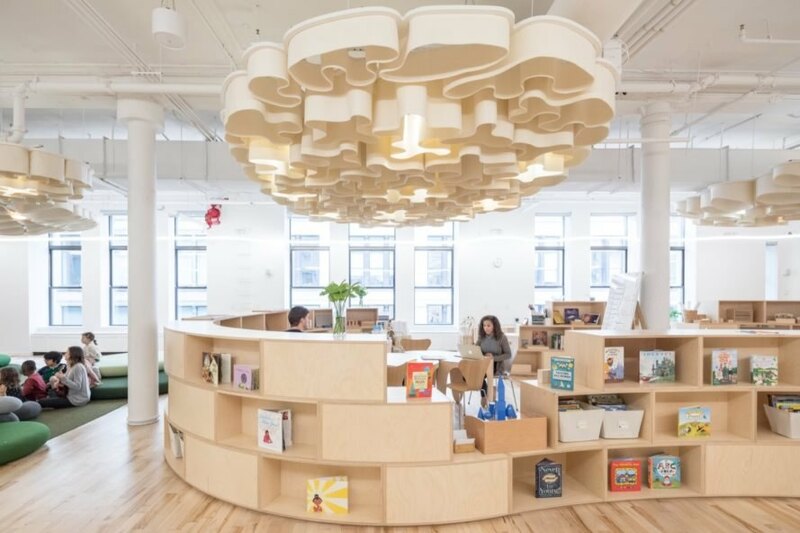 WeWork and BIG have collaborated on a new school in New York City. The school is meant to encourage learning through play. Furnishings and design elements encourage kids to learn, play and read. The design also includes spaces for adults to work and socialize. WeGrow includes four classrooms, an art studio, flexible workshops, a community space, a multipurpose studio and a music room. The design draws inspiration from nature. WeGrow is quite different from traditional schools. Children can socialize and play freely. Organic forms and strategic design invite kids to explore. The school allows open communication among teachers, parents and students.